The sixth gym is in Saffron City, it is close to Celadon City. You just beat Koga and can head from Fuchsia City to Saffron City. Now Saffron City, like most of the other towns, has some other things you can do. Saffron City has a fighting dojo where you fight fighting type Pokemon trainers, if you beat them all you can get a Hitmonchan or a Hitmonlee. Saffron City is also home of Silph Co. Silph Co. invented almost everything you can get from Pokeballs to Potions. Team Rocket raids the place and you need to fight them off. You also meet you rival there and he challegnes you to a battle. There is someone in the building that is so grateful that you saved Silp Co. that he gives you the water type Pokemon Lapras. You must have no more then 5 Pokemon in your party when you receive the Lapras. Once you make it to the final floor of Silp Co. you will meet the president. And I think the Team Rocket boss is there and you have to fight him first. After he leaves the Silp Co. president will give a Master Ball. As you should know, a Master Ball is a Pokeball that never fails. That’s just about it for Saffron City, now let’s head to the gym. In the gym there is a teleporting type of puzzle if I remember right. There are several platforms you can walk on and you teleport to a new room. If done correctly you’ll teleport into the room with the gym leader Sabrina. The main status condition you should worry about is confusion. Sabrina knows telekinesis and is a Psychic Pokemon Master. You’re in for an intense battle! The first Pokemon she send out is a Kadabra, just be careful, psychic types usually have good special attack. Once the Kadabra is taken down she sends out a Mr. Mime. The Mr. Mime would probably go down fairly easily. Then she’ll send out a Venomoth you should be able to take it down with a fire Pokemon. The final Pokemon she has is her strongest, it is a level forty three Alakazam. This shold be hard to take down. If you happen to succeed you will get the Marsh Badge. Only two more gyms left and you can challenge the Kanto Pokemon League! You just beat the Celadon City gym which is the fourth gym in the Kanto region. What next, what place is the fifth gym? You best have a bicycle for getting around now! In order to get to Fuchsia City you must have a bicycle for the simple fact that you have to go through Cycling Road. Cycling Road is a giant downhill slope that will take you from Celadon City to Fuchsia City. Many bikers will stop you along the way and challenge you to a battle. They are sort of strong but if your Pokemon are at good levels and were able to beat the fourth gym leader you should be able to handle it. By the time you arrive to Fuchsia City you should be able to head straight to the gym. However you might want to check out the Safari Zone. The Safari Zone is a place where you can capture certain Pokemon. There is a fee to enter and you have to use Safari Balls to capture the Pokemon. You can’t just attack them, you actually can’t attack them sadly. You must throw bait. It’s not as bad as it sounds, it is actually not bad at all seeing that these Pokemon are pretty rare. But you should go and check out the fifth gym now. The fifth gym is a poison type gym. This really does give you a good hint that you will need Antidotes and Full Heals to cure your Pokemon of the poison status condition, because it does get in the way. This gym can be a pain because there is an invisible wall that you have to work your way through, meaning if you get caught in this maze you can end up fighting even more trainers. Once you arrive to the gym leader, Koga be ready to face him, he is a ninja! Koga has four Pokemon, I believe it is the most so far, I think the last gym leader had three. The first Pokemon he will use is a Koffing, just play your cards right and you can defeat it, then he has a Muk, just take it down the same way as you did the Koffing and you can get it. He will then use another Koffing which is the same level as the first Koffing so I guess just battle it the same way. And the best for last, his strongest Pokemon is a Weezing. It is at level fort three. Everything should be going fine as long as you have the full heals or antidotes. At most you would probably have to use a healing item like a Super Potion. After beating Koga you will get the fifth badge, the Soul Badge. You only have three more to go, the next gym is in Saffron City! The fourth gym in the Kanto region is located in Celadon City. Celadon City is either the biggest town in Kanto or the second. You should now have the Boulder Badge, the Cascade Badge, and the Thunder Badge. This must mean your in Vermillion City. It is now time for you to head to Celadon City. In Celadon City there is literally a lot to do. For starters, the game corner is in Celadon City. The game corner is just a bunch of mini games and you earn coins. You can also just buy coins but the prizes are great. Such as the TM Flamethrower or the TM Ice Beam. Ice Beam is a powerful Ice type attack that can be taught to some Pokemon. Flamethrower is a powerful fire type attack that can be taught to some fire type Pokemon and even some Pokemon that aren’t fire type. The game corner is definetly something you should consider messing with when your in Celadon City. There is also a building where you can get the Tea. The Tea is what you give the gate guards to let you pass. I believe there is a few trees you need to use Cut on in order to enter the fourth gym. Once you enter it will look like a complete garden. This is because the fourth gym is a grass type Pokemon gym. You will have to fight several trainers before you can get to the leader. I suggest you bring some Paralyze Heals, Full Heals, Antidotes, whatever you can to cure some status conditions. Because with some grass type Pokemon in this gym, they have some attacks like Stun Spore Sleep Powder and Poison Powder they can use that can be a nuisance on your part. Upon arriving to the leader, Erika. You should make sure your Pokemon are at full health and then challenge her to a match. The Pokemon are getting stronger for the gym leaders. Her first Pokemon is a Victreebel if you have fire type Pokemon now is the time to shine. Her second Pokemon is Tangela, which should be fairly easy to take down. The final Pokemon you have to fight is a Vileplume. Be careful because this Vileplume knows Stun Spore and Sleep Poweder. If you beat Erika you will get the Rainbow Badge. You will also now have half of the Kanto badges. 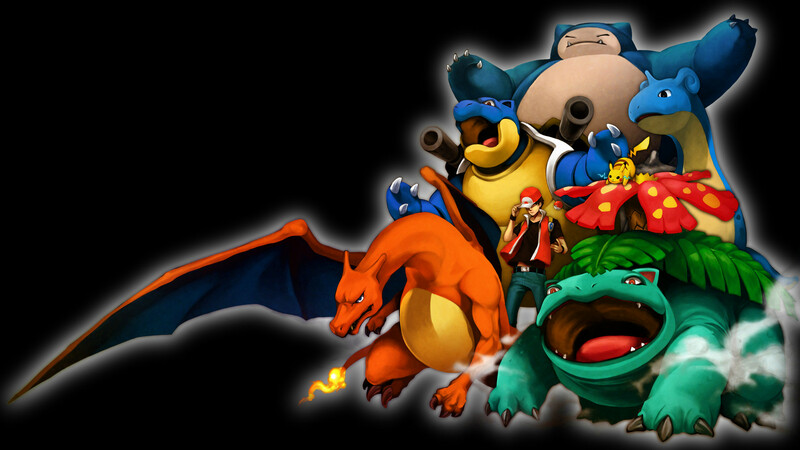 Only four more to go and you can challenge the Kanto Pokemon League! Next up is the gym in Fuchsia City! You just beat the second gym in Cerulean City. Now it’s time to head for the third gym! The third gym is located in Vermillion City. There are a lot of sights you should see before you head straight to the gym. You need to remember that the gym leaders get stronger and you always need to be prepared. The first place I suggest you seeing in Vermillion City is the SS Anne. It’s a famous ship and its huge. You can fight a lot of trainers and that will help you get stronger. Just check every door in the ship in a handful of them there is a trainer that will battle you. About the time when your outside the captain’s door you will bump into your rival again. Your rival will challenge you. He got a lot stronger since last time so be prepared. If you successfully beat him you can enter the captain’s room. In the captains room there is not much besides the steering wheel and the captain. Speak to the captain. He will give you the HM Cut. Cut will allow you to cut the tree blocking the entrance to the third gym. Once you leave the SS Anne the ship itself will be departing. Now you can head on over to the third gym. This gym is sat up fairly strange. There are trash cans or at least what looks like trash cans. And a switch in every one. You have to hit the three correct switches in the right order. That will unlock the door to the gym leader. The gym leader is Lt. Surge. He trains electric type Pokemon. Just to mention, the third gym is an electric type gym. Lt. Surge will open the battle with a Voltorb, you should be able to take it down quickly. You probably wouldn’t have any problems with Lt. Surge unless you chose Squirtle, electric type Pokemon have an advantage over water type Pokemon. The second Pokemon he sends out is a Pikachu. The Pikachu should go down if you don’t let it take advantage over you. The final Pokemon and his strongest is a Raichu. The Raichu may take a while, but you can do it in the end if you keep trying. If you successfully beat him, Lt. Surge will give you the Thunder Badge. You have three badges now, the next gym is in Celadon City! The second gym you will find in the Kanto region is in Cerulean City. You just beat Brock the first gym leader in Pewter City and now your ready to fight the second gym leader! Not yet, you still have to get to Cerulean City. After you leave Pewter City you should find yourself arriving by a cave area pretty soon. This cave is known as Mount Moon. Mount Moon is a tricky place, a lot of trainers would want to challenge you and you might even run into a few Team Rocket grunts. Throughout Mount Moon you will find many Pokemon, mainly rock type or ground type. But you can also run into a Clefairy, the Clefairy’s home is Mount Moon so you might encounter a few in Mount Moon. Towards the end of Mount Moon, or I should say when your around the exit you will see two fossils. The Dome fossil and the Helix fossil I believe. Choose one on your way out and start heading to Cerulean City! Now that your in Cerulean City your rival might appear to challenge you, it is about time don’t you think? The least battle you had was way back before you beat the first gym! Once you defeated him you should take a look around, the Nugget Briidge has lot of trainers you can challenge to help your Pokemon get stronger to fight the gym leader. If you successfully beat all of the trainers on Nugget Bridge you get a Nugget. A Nugget is an item that you can sell and get a lot of money. Bill the creator of the Pokemon Storage System in the Kanto region lives at the end of a patch east of the end of Nugget Bridge. Well let’s get down to the second gym. It is a water type Pokemon gym. Meaning all the Pokemon you fight in the gym are water type. If you chose Charmander, it might have a bit of trouble. Water type Pokemon have an advantage over fire type Pokemon. You will fight a few trainers in the gym and then you can challenge the leader of the gym, Misty. Misty has a Staryu and a Starmie, Starmie is the evolution of Staryu as you would have guessed. Take out the Staryu as fast as you can because the strongest of Misty’s Pokemon is the Starmie. If you successfully beat Misty, you will be rewarded with the Cascade Badge. Now you have two badges and can head to Vermillion City, where the third gym in the Kanto region is waiting. Most trainers, or probably the older community of trainers started their first Pokemon journey in the Kanto region. Charmander, Squirtle, and Bulbasaur are the starters you can get there. The Pokemon professor Samuel Oak is the one who gives trainers their starters, he studies Pokemon and human relations. The main goal when a trainer starts their journey is to challenge the Pokemon League. In order to challenge the Pokemon League you must gather the eight gym badges of the region. The eight gym leaders of the Kanto region are Brock, Misty, Lt. Surge, Erika, Koga, Sabrina, Blaine, and Giovanni. However in the more modern versions of Kanto, Koga is in the Elite Four so his kid Janine takes over the gym. And the last gym leader of the Kanto region, Giovanni, quit for unknown reasons so Blue took over. The first thing you should do is to make sure you have enough Pokeballs and Potions, usually about three Potions and five Pokeballs work out good enough for the beginning of your journey. You will go through Viridian Forest and find yourself in Pewter City. Pewter City is the place where the first gym leader is at. The gym leader is Brock, he trains rock type Pokemon. So it might be a little hard to beat him if you chose a Charmander as your starter Pokemon. This is because a rock type Pokemon has a type advantage over fire type Pokemon. Brock will use two Pokemon against you. These two pokemon are both duo types. This means instead of having one type they have two. In this case they a ground type and rock type Pokemon. The first he will use is a Geodude. The Geodude can be defeated quickly if you chose a Squirtle that probably learned Water Gun by now. Or a Bulbasaur that probably learned Absorb. If you have enough potions and a few other Pokemon aside from your starter with you at this time it should make it a bit easier if you choose a Charmander. Don’t get me wrong, Charmander is a great and powerful starter, it’s just the first few gyms have a type advantage. If you win Brock will give you the Boulder Badge, the very first badge in the Kanto region. Only seven more to go! Next up is the water type gym in Cerulean City! It’s orange, lizard-like, and obnoxiously cute! Charmander, the Lizard Pokemon, is the first fire-type in the National Pokedex and is also the Kanto region’s fire-type starter. Charmander is the tallest of all fire-type starters and a fan favorite for its evolutionary line. It also has the longest name of any unevolved Pokemon. According to its pokedex entries, Charmander’s flame at the tip of its tail makes a slight crackling sound that can only be heard in quiet places. That flame is said to burn in reaction to its emotions; if it’s content its flame wavers, while that flame will burn brightly if it becomes enraged. Its pokédex entries also state that if the Charmander is healthy, it will burn vigorously even when becoming wet. It will die if the flame ever burns out, as the flame is a measure of its life force. Charmander is based off from a salamander, though it also has features of lizards too. Its name most likely comes from the words ‘char’, which means “to burn”, and ‘salamander’, an amphibian found in Japan (which is where the games are made). Charmander may also be inspired by fire-spirits who are said to be able to inhabit the hottest temperatures. Those fire-spirits are often depicted to be lizard-like. It’s small, turtle-like, and rarely found in the wild. Squritle, the Tiny Turtle Pokemon, is the Kanto region’s water-type starter and is considered the balance between the three. While the Charmander line is supposed to be rash and hard to train, the Bulbasaur line is just the opposite as its mild mannered and well behaved. The Squirtle line isn’t hard to train, but it also isn’t the mellowest of evolutionary lines either. According to its pokedex entries, Squirtle is born with a soft shell that eventually hardens on its back. When feeling threatened, it will shrink into its shell and spray its foe with a powerful jet of water. Though its shell isn’t just used for protection. The rounded surface of it and ridges help reduce water resistance and allow it to swim at high speeds. Squirtle is the first water-type Pokemon listed in the National Pokedex and is also the most trained Kanto starter in the anime (Ash, Gary, and May all trained a Squirtle of their own at one point). Squirtle’s design is based off from a turtle. Its name is most-likely a combination of the words ‘squirt’ (which could reference its small size or the fact that water can be squirted) and ‘turtle’. It’s green, oddly shaped, and seems to have a plant growing on its back. Bulbasaur, the Seed Pokemon, is the first Pokemon listed in the National Pokedex and is also the Kanto region’s grass-type starter. Because Bulbasaur is the first entry in the National Pokedex, by default it is automatically the first grass-type, poison-type, dual-type, and starter Pokemon in the National Pokedex order. Bulbasuar is also the only dual-type, unevolved starter. According to its pokedex entries, it was born with the bulb on its back and can store enough energy there to last it days without needing food. As it grows, so does its nutrient-filled bulb. Bulbasaur tend to like soaking up the sun’s rays, which also helps its bulb grow. Bulbasaur’s name seems to come from the words ‘bulb’ and ‘dinosaur’, though the word ‘saur’ is actually Greek for “lizard”. Appearance-wise Bulbasaur looks somewhat similar to a frog or toad, though it’s also been speculated over whether or not it could also be based on some form of Dicynodont – a sort of mammal/reptile creature that lived in the Permian period (which would explain its toes). Unlike amphibians, though, Bulbasaur has ears atop its head.